Welcome to Titan Fabrication where metal fabrication and machining is our business and passion. Titan Fabrication is your business partner for projects of all kinds. We are a first class welding/machine shop located 20 miles north of Montgomery in Prattville Al. 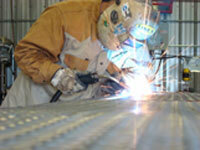 We can help with all of your fabrication and repair needs, from design to finished product. We offer high quality products at reasonable prices. Titan Fabrication has the capabilities and flexibility to meet your needs. Need something repaired? We will determine why it failed, and repair it better than original part, usually at a lower price than the original.